Obama Wants Graduates to Work in Factories? 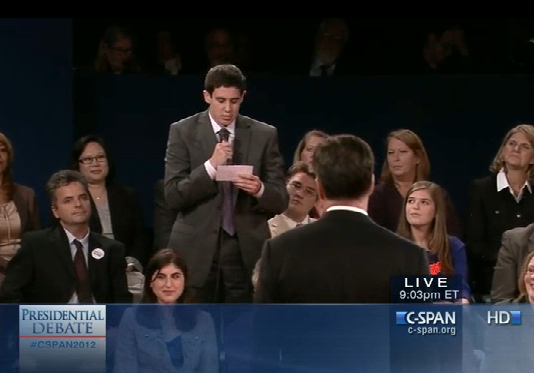 Jeremy Epstein, a 20-year-old student worried about his future jobs prospects, kicked off the debate last night with an important youth-centered question which neither candidate answered well, especially Governor Romney. The youth vote is up for grabs””a recent CBS/NY Times poll showed a nine-point race””and Romney was pitched a softball. He whiffed or at best hit a foul ball. Romney does a great job describing middle class misery under Obama, and his answer on this question would’ve been explosive if he was paying closer attention to youth issues. President Obama promises young people unlimited student aid and free (parent-funded) healthcare. Romney can’t play that game. Young Americans have never been more economically miserable in the modern era than in the last four years. Youth unemployment has averaged 17.5 percent, public college costs (tuition, room, and board) have risen 20 percent, and underemployment for graduates with jobs is more than 50 percent. ObamaCare is raising youth health insurance costs 45 percent. Under Obama, young Americans incomes have dropped 6 percent, while their costs of living have spiked. Yet, Romney didn’t point that out. His best stat, poorly delivered, was that half of graduates are either unemployed or underemployed. Youth issues are Obama’s weakest area (besides Benghazi). But, Romney’s best answer was to personally promise Jeremy a job by 2014, while saying he’d continue Obama’s college loan policies””policies which have led to a 25 percent spike in tuition. Romney’s answer empty. The good news is that Obama’s answer was even less appealing. He promised Jeremy to increase manufacturing and factory jobs. Who wants to take out $30,000 in student loans to work in a factory? Obama’s points were obviously for a generic audience, not for a graduating college student. Younger voters wanted a direct answer from these candidates, but all we got was weak rhetoric and empty promises. Romney can win disenchanted and unemployed young voters, but he needs better persuasion points. At this point, Romney needs to give a speech laying out the troubles Generation Y (or what I call Generation “Why Us?”) faces. These issues include high unemployment, skyrocketing college costs, and a mounting national debt, and all three have been made worse by President Obama. If Romney wins 45 percent of the youth vote, there’s almost no mathematical way he loses this election (assuming 2004 turnout for young voters). The last Pew poll put him at 42 percent, so he’s close. Young people are beginning to trust him on economic issues, but Romney needs to close the deal. Last night didn’t help. Ron Meyer is the Press Secretary and a spokesman for American Majority Action. Formerly the spokesman of YAF, he has been a frequent guest on Fox News, CNN, and the Sean Hannity Radio Show.